If you're a student who flies to school each semester, you've already got a couple things on your mind: When does that flight leave again? Did you forget to pack anything? With the Indestructo Airline Durable Trunk - ATA Approved Travel Case, at least you won't need to worry about your dorm stuff breaking during transport. While your luggage may have shifted during flight, the removable interior foam pad and the exterior ARMOR high-impact composite will make sure this trunk's contents are very well-protected. All of our dorm trunks offer solid housing for your dorm items, but this Indestructo model is our toughest—it's ATA-approved for flying! It's our only college dorm room trunk that you can confidently ship on a plane or with UPS to your dorm and know it'll hold up to a beating. 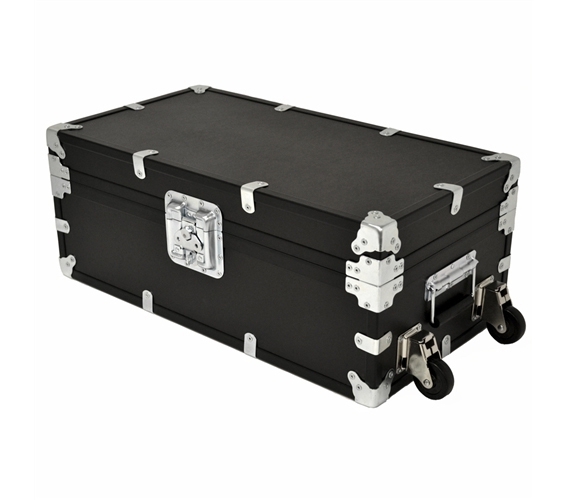 Your back-and-forth travels from home to dorm and dorm to home and back again need this collegiate trunk. 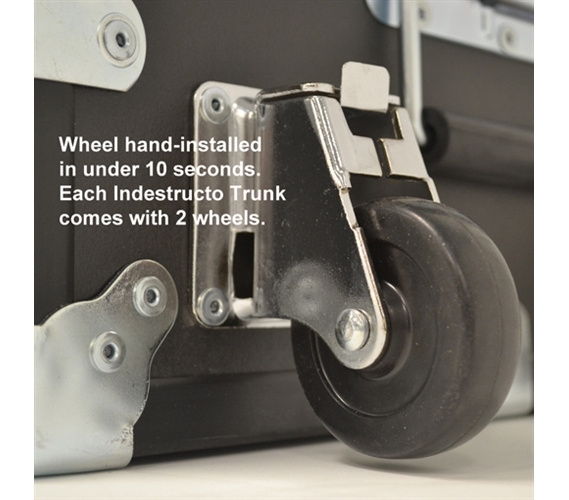 Use our Indestructo Airline Durable Trunk as your suitcase, organizer or storage unit. It's great for packing up clothes, dorm bedding, study supplies, and any college stuff you'll need in the dorms. 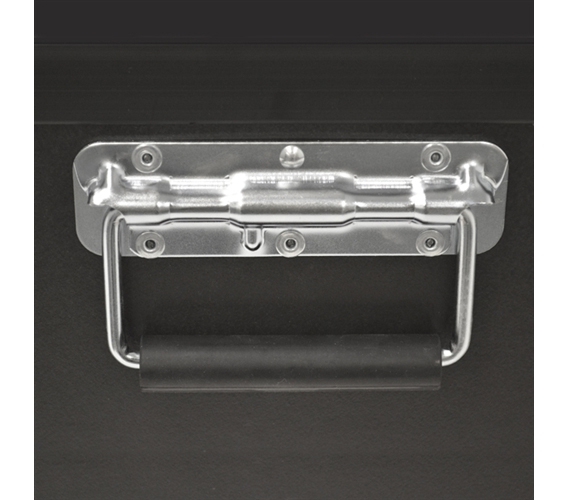 The removable wheels make moving this college trunk easy, even when it's heavy. And even if your commute to college involves a long drive, this trunk will more than keep things secure on the bumpiest roads. 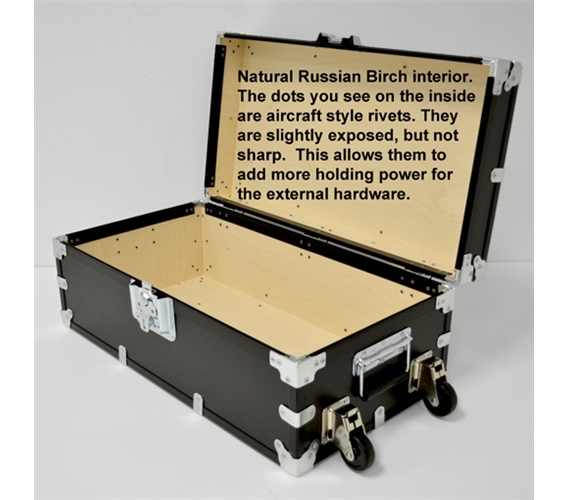 With premium-grade Russian Birch hardwood plywood and steel aircraft-style rivets, this dorm footlocker trunk is a fine example of made-in-the-U.S.A. craftsmanship. Fragile dorm essentials such as mirrors, lamps, and that framed photo of mom and dad can't afford to get broken. So transport your dorm supplies with peace of mind—not broken pieces! Exterior constructed of ARMOR high-impact fiber composite. This gets laminated over Russian Birch hardwood plywood. 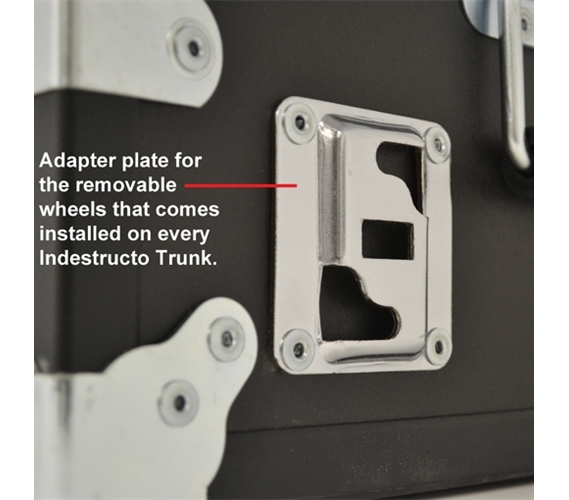 Each Indestructo Airline Durable Trunk comes with 2 nickel plated steel universal wheel adapter plates already mounted on the side of the trunk. This allows you to easily add or remove the specially designed 200 pound rated wheels to your trunk anytime you want, anywhere you want in a matter of seconds. They’re extremely easy to use! No tools are needed, nor does the trunk need to be lifted to install them. Best of all, these advanced design wheels do not add any extra height to the trunk. Even with the wheels on, the trunk is stackable. The wheels come with this trunk at no extra charge. About: Measures 1" high by 3" long. Lettering can be in upper or lower case, whichever you prefer. Lettering is in black. Most people put their full name on, but its your choice. 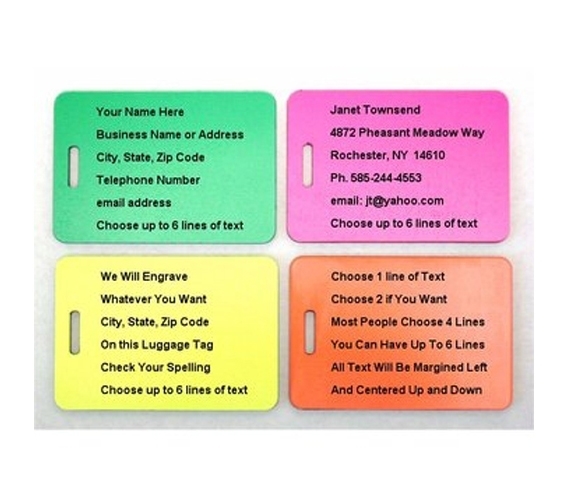 You can have your name on one or two lines. On the back of the name plate is a self-sticking adhesive. Therefore, you can place the name plate anywhere you like on the College Trunk. 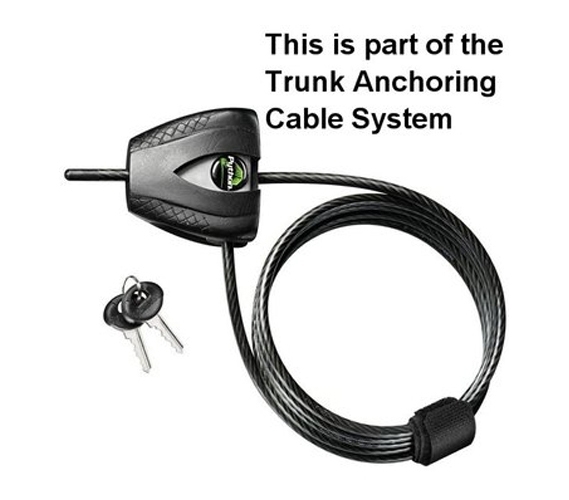 About: Besides eye bolt, in the kit is a Masterlock Python 1/4″ × 6′ cable and lock. 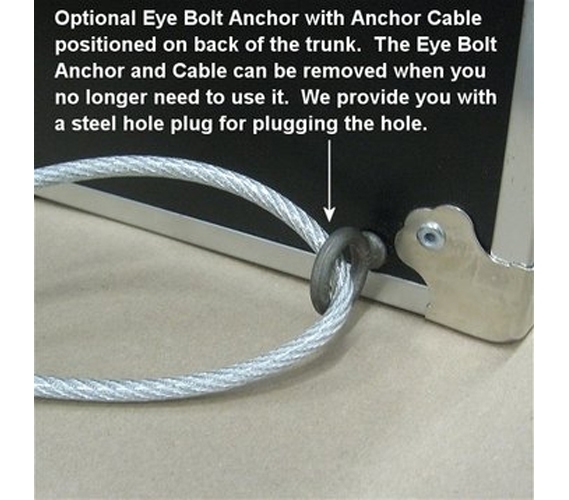 When not using the cable, you can remove the eye bolt and plug the hole with a provided steel hole plug. This system is easy to use and will provide the extra peace of mind and security in any dorm room environment. 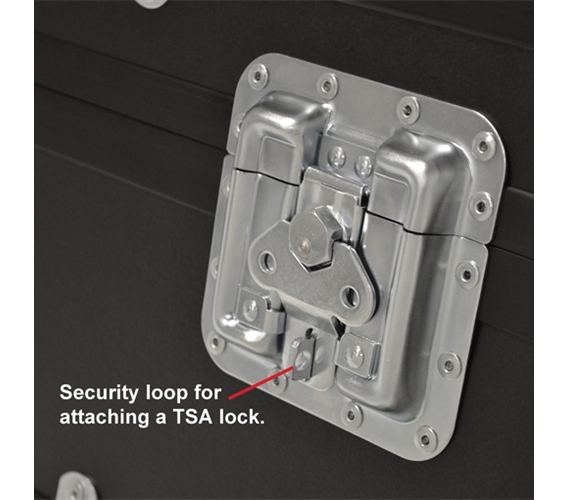 The high-tech American Made Indestructo Travel Trunk is engineered with one purpose in mind: to withstand the abuse of airline baggage handlers and shipping companies. 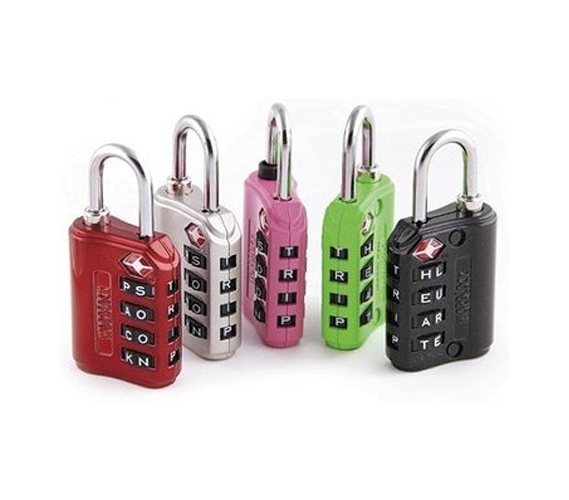 It is constructed of lightweight, yet extremely durable components. This allows it to be packed full and still stay close to the 50 pound airline weight limit (depending on what you pack in it). It meets the airline’s checked baggage regulations & is 100% durable to deal with the abusive tossing by airline baggage personnel. It comes as you see it – including easy to use removable wheels. The outer shell of this Indestructo Airline Durable Trunk is constructed of a very strong, water resistant, crack proof fiber composite which saves weight while still providing superior protection. Black colored and finished with an attractive satin clear coat and is laminated over Russian Birch hardwood plywood. 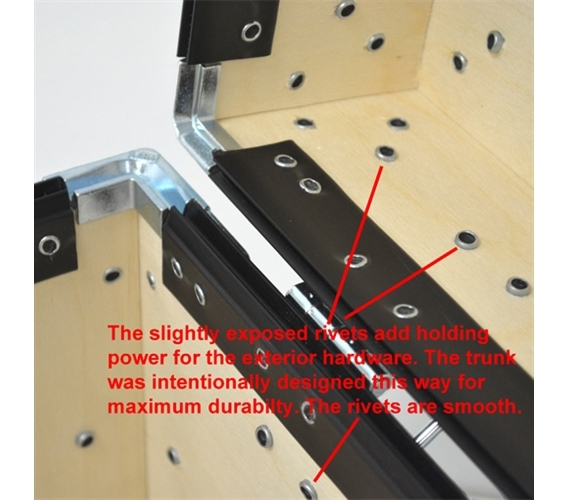 The combination of these two components provides structural integrity along with excellent rigidity and impact protection no matter how poorly it is handled. 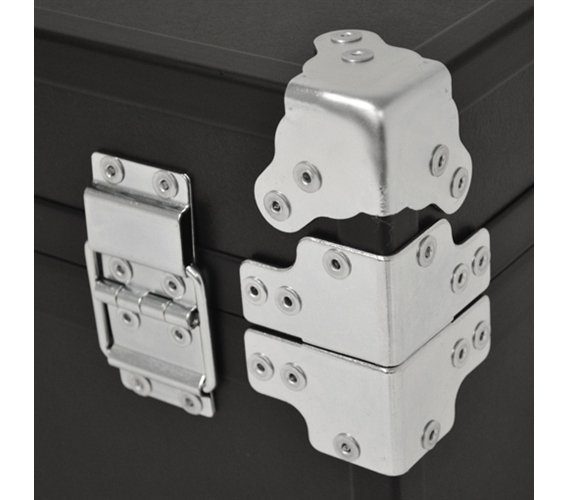 Combine our proprietary heavy gauge polymer extrusions and overbuilt hardware and you have a college footlocker that will provide years of service. Like all cases and luggage, these trunks will show scratches and wear as they get used. However, this is normal and will not effect their functionality.